The summertime restriction of E15 sales lifted on Sept. 16, allowing customers across the nation to once again access the fuel blend. 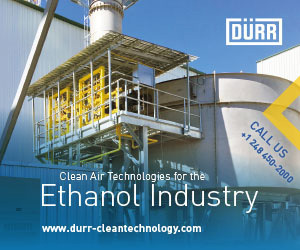 Representatives of the ethanol industry are working to ensure barriers to year-round sales will be lifted soon. Clariant has officially started construction on the first large-scale commercial sunliquid plant for the production of cellulosic ethanol made from agricultural residues. The facility is located in Podari, Romania. Fluid Quip Process Technologies has announced the commissioning of the FQPT Maximized Stillage Co-Products system at the Flint Hills Resources Fairmont, Nebraska, facility. The MSC technology produces high-value protein animal feed. The Surface Transportation Board has announced the Rail Energy Transportation Advisory Committee meet Oct. 4 in Washington, D.C. The committee addresses issues related to the rail transportation of energy resources, including ethanol. The U.S. Department of Energy has announced it will award 42 projects a total of $80 million to support advanced vehicles technologies research, with $10.1 million funding six projects focused on the co-optimization of engines and fuels. ASTM International’s bioenergy and industrial-chemicals-from-biomass committee (E48) is creating a standard that will help companies that produce biofuel using—in part—kernel fiber. Ergon BioFuels LLC, a subsidiary of Ergon Inc., has announced plans to close its ethanol plant in Vicksburg, Mississippi, in December 2018. The 26.5 MMgy plant was constructed in 2007.